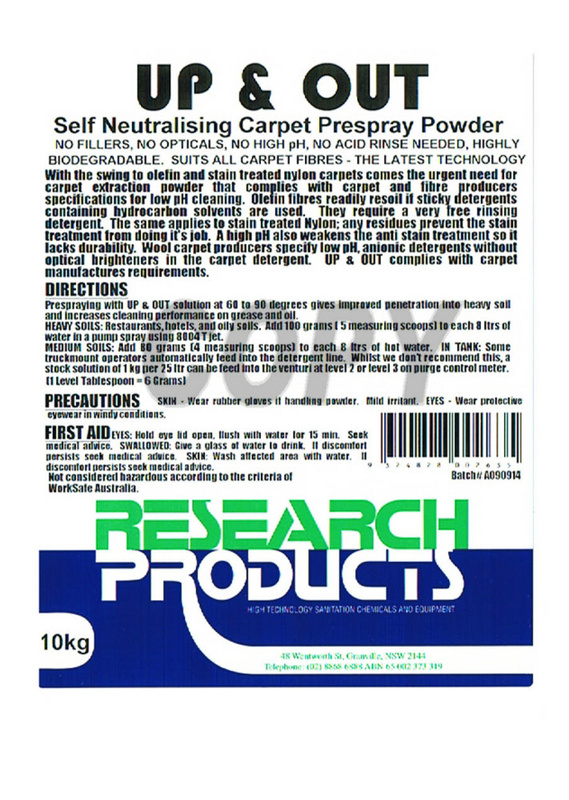 Self neutralising carpet prespray powder. No fillers, no opticals, no high pH. At last a powder that reduces in pH and total alkalinity as it dries in the carpet. It cleans even the toughest food and drink spill stains in restaurants and pubs. Safe on all fibres, super economy. A breakthrough enzyme powder prespray formulation that meets ANZS 3733 in all areas. Most powdered presprays on the market today are derived from American technology which caters for American carpets that are 98% synthetic on average Carpets in the U.K., Australia, South Africa and New Zealand have a far higher percentage of wool. In the commercial areas in these countries, wool would represent at least 80% of the market. With the swing to new generation nylon and stain treated fibres there has been a strong rejection of alkaline powder producers because they reduce the life of the stain coating. High pH on wool carpets has never been acceptable due to fibre damage. Many companies still persist with products with a pH of 12.5 or more. Developed using the newest technology anionic free rinsing surfactants and grease emulsifiers. 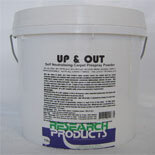 UP & OUT is designed for today’s carpets and today’s soil conditions. With over 50% water softeners and scale conditioners, all carpets whether poly, wool, nylon or acrylic will be left softer and will dry without the grey hard water scale that dulls the life from the carpet each time that you clean. A unique and novel buffering system allows the pH to drop from 9.5 @ 1% down to below 8.5 on the fibre even if rinsing is not completed effectively. Normal carpet cleaners’ theory says if it isn’t strongly alkaline it doesn’t clean. (e.g Formula 90 12.5 pH @ 1%). Up & Out, due to its clever chemistry not only cleans, it cleans brilliantly. Stains like soft drinks, gravy even acid side stains like grass and vomit are removed if the prespray is given extended soak time prior to rinsing. Powders have traditionally allowed extremely small dosage into a hot prespray for economy. Up & Out continues that trend plus it has added safety of self neutralising. We estimate that it will reduce chemical costs by over 50% compared with prespray liquid. Self neutralising to 8.5pH on the carpet. Extremely safe on all fibre types. Removes more stains due to new tech ingredients developed in year 2000. 40 grams (two measuring cups) Per 8 ltr of hot water. Add powder, and then add hot water Hot water improves cleaning power and penetration into the fibre.